Create a Bedtime Tradition in Just 5 Minutes. Delight your little ones with these sweet Precious Moments® characters as you share beloved Bible stories and comforting bedtime scriptures with them. The five-minute format helps parents create a meaningful bedtime. With paraphrased stories from the International Children's Bible®, you'll nurture a love for God's Word. Take five minutes before bed to create a special connection with your precious child. Precious Moments 5-Minute Bedtime Treasury by Precious Moments is such an adorable book! My kids love anything Precious Moments so I wasn't surprised that they loved this book. My favorite think about this book is that the stories are short five minute stories that are perfect for bedtime. I love that it's filled with Bible stories that will comfort my kids as they drift off to sleep. The illustrations are beautiful and my kids often sit and look and the illustrations just for fun. 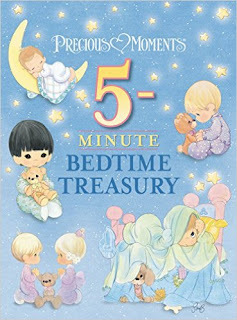 Precious Moments 5-Minute Bedtime Treasury by Precious Moments is a wonderful book and I highly recommend it. by Precious Moments on Amazon, Barnes and Noble and other bookstores.